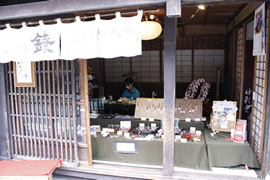 Kazariya Ryo is an antenna shop of Chikuedo, which has been producing metal craftworks for more than 200 years in the traditional Japanese city of Kyoto. 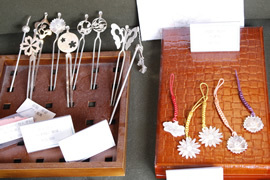 With "Kazariya" meaning "decoration shop" and "Ryo" coming from "nanryo," a pure silver*, this shop specializes in creating silver items. 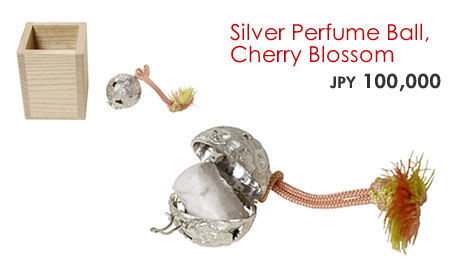 The quiet beauty of silver, more subtle than that of gold, is well suited to the restrained Japanese sense of aesthetics. Oxidation causes silver to change over time, producing a development in character that is one of its charms. 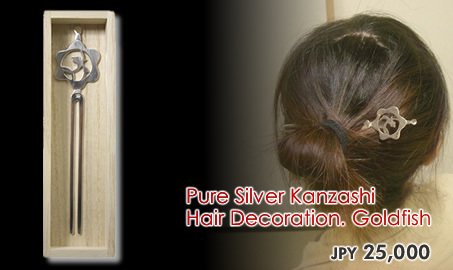 The mostly young staff of Kazariya Ryo have also been captivated by the magic of silver, and work hard to develop their shop and produce high-quality items in the hope that you too will share their passion. 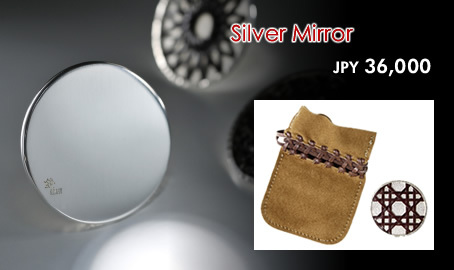 They would love to see you using silver in your everyday life and witness its subtle changes over time. 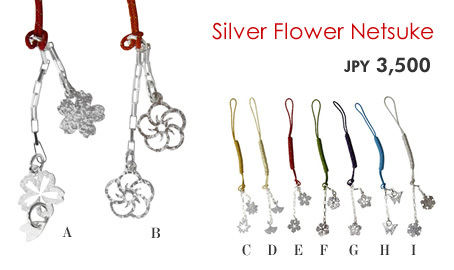 *Nanryo is high-quality--that is, very pure--cupellated silver. "Nanryo nishu-gin," coins, used in the Edo era (1603 to 1868) had a purity of 98%. Look further into the shop and you can see artisans carefully working silver. Passers-by find it difficult to walk by without taking a look. It's hard to resist fine silverwork. 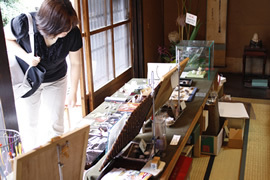 The shop is also popular with tourists, and lots of overseas visitors buy souvenirs there. 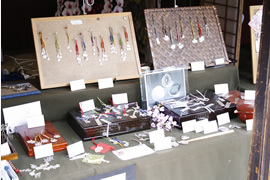 The front of the shop is packed with silver items. Each is carefully made, a fact that's obvious from even a brief glance. And even a brief glance at the array of pieces on display is enough to captivate. Designed to look like a goldfish bowl viewed from above. When not using, keep it in its paulownia wood box. 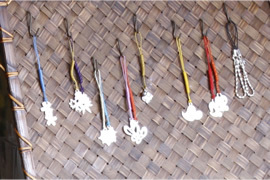 Flower designs hand-cut one by one, and attached to silver chains to create netsuke (traditionally used to secure belongings to a belt). The cord is pure silk. 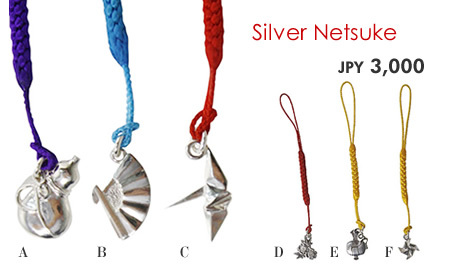 Lucky Japanese motifs rendered in silver. Attach to your cell phone, your wallet or a small case. 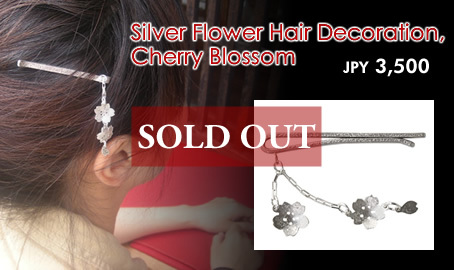 A dangling hair decoration inspired by those worn by maiko (apprentice geisha) but given a modern twist. The cherry blossom shapes are made lightly bumpy, and holes are punched in the center. This item has a beautiful, delicate air. The design is first drawn on paper, and this is then stuck to the silver. The silver is cut following the paper design. After cutting, the paper is removed. The design is taking shape. There are still fine protrusions around the edge, so these are carefully smoothed down. Shaping is now finished. At this point 70% of the work is done. A hole for the strap is added. The "Ryo" stamp is added. The piece is complete. It is now ready to go on display in the shop, perhaps combined with other pieces to make a larger design. 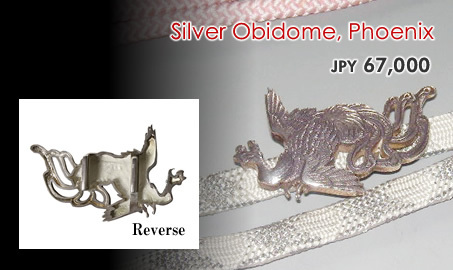 An exquisite silver obidome, one of the decorations worn on the belt of a kimono. Can of course also be worn with Western clothes too. 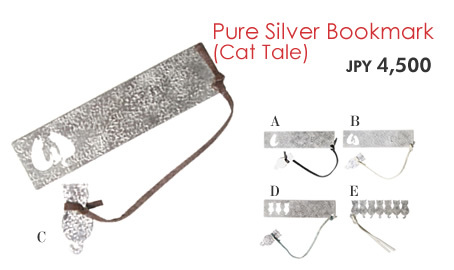 A silver bookmark featuring a variety of cats, including one on the end of the cord. An elegant incense holder covered in delicately engraved cherry blossoms. Place the perfume sachet inside and wear it on the belt of a kimono. With fine bamboo work on the back to create a beautifully delicate piece. Comes in a high-quality leather pouch. The black marks that form on silver are caused by the top layer of the silver itself changing color due to oxidation. The color change starts as a yellowing that then progresses to a gray or purple color, and finally to black. Wiping with a dry cloth will produce a natural range of tones, giving the item that special character that long-used silver has. If silver is marked with oil or fingerprints etc., wiping with lukewarm water and baking soda using a soft cotton cloth will remove light yellowing. (It is important to wipe off all moisture after doing this.) Special products for polishing silver (such as Glanol) also exist. 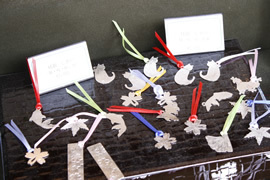 Please note, however, that these are unsuitable for certain silver items (such as those that have been plated or colored).